This garden design Haslemere is the second garden that we have designed and built for this client. From the outset we were asked maintain it upon completion. Our brief was to create an interesting series of spaces around the property to reflect the way our clients used their home. There was an awkward space at the rear that was specifically orientated to be viewed from inside the house which lead to the creation of the water rill and sculpture. The sculpture is called ‘Forever Ivy’ and is made of Corten steel by Andrea Geile. We now have a fantastic fly-through video of the finished Garden design Haslemere, including an interview with the client. The contemporary use of paving with distinctive large joints was to allow drainage and be SUDS compliant. 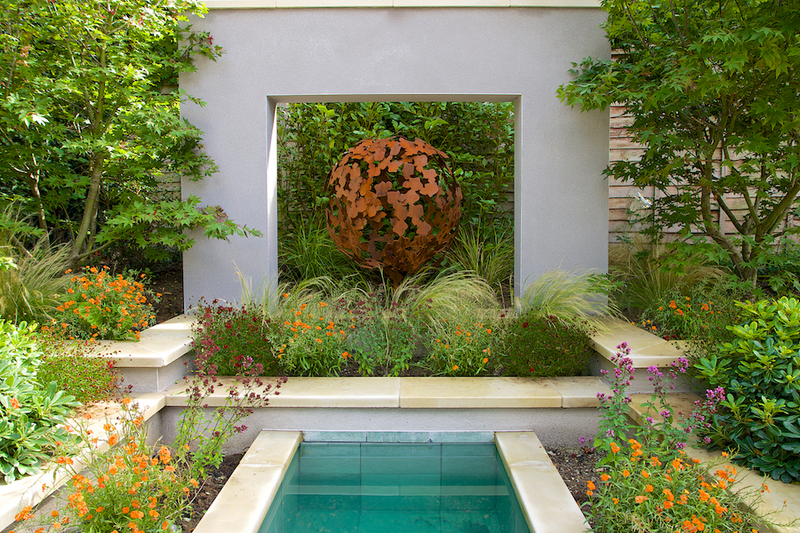 This paving radiates out from the central focal point, a specially commissioned sun-dial upon a stone column. The mixed perennial planting scheme is complimented with the strong lines of Lavender and Taxus hedging. A full lighting scheme was implemented and a 12 month maintenance plan provided. Breedon gravel and porous resin bound gravels make up the remaining paths.